It was founded by Walter Gropius in Germany as an experimental pedagogic centre in which they aimed at uniting architecture and design. It started its decadence in the 30s but it was highly influential in other countries to which its members emigrated. 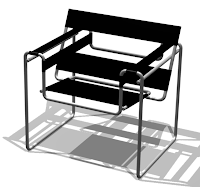 Bauhaus style became one of the most influential currents in Modernist architectured modern design. The Bauhaus had a profound influence upon subsequent developments in art, architecture, graphic design, interior design and typography. The school existed in three German cities (Weimar from 1919 to 1925, Dessau from 1925 to 1932 and Berlin from 1932 to 1933), under three different architect-directors: Gropius from 1919 to 1927, Meyer from 1927 to 1930 and Mies van der Rohe from 1930 to 1933, when the school was closed by the Nazi regime. The changes of venue and leadership resulted in a constant shifting of focus, technique, instructors, and politics. The foundation of Bauhaus occurred at a time of political and cultural upheaval in Germany. Defeat in World War I, the fall of the Germany monarchy and the abolition of censorship under the new, liberal Weimar Republic allowed an upsurge of radical experimentation in all the arts, previously suppressed by the old regime. Many Germans of left-wing views were influenced by the cultural experimentation that followed the Russian Revolution, such as constructivism. Such influences can be overstated: Gropius himself did not share these radical views, and said that Bauhaus was entirely unpolitical. Just as important was the influence of the 19th century English designer William Morris, who had argued that art should meet the needs of society and that there should be no distinction between form and function.. Thus the Bauhaus style, also known as the International Style, was marked by the absence of ornamentation and by harmony between the function of an object or a building and its design. The most important influence on Bauhaus was however modernism, a cultural movement whose origins lay as far back as the 1880s, and which had already made its presence felt in Germany before the World War, despite the prevailing conservatism. The design innovations commonly associated with Gropius and the Bauhaus - the radically simplified forms, the rationality and functionality, and the idea that mass-production was reconcilable with the individual artistic spirit - were already partly developed in Germany before the Bauhaus was founded. 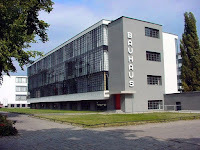 Gropious designed the Bauhaus building at Dessau, the most emblematic construction of the movement.The first important work made by Gropius was the Fagus factory in 1911. It was conceit as a beautiful combination of iron and glass, but its main work is the Bauhaus building in which teachers and students collaborated. The plan of the Bauhaus building is formed by three sections that expand freely and multiply the points of view. The walls are of concrete and glass. There are a number of characteristics to the Bauhaus/International Style of architecture: 1) It shuns ornamentation and favours functionality 2) Uses asymmetry and regularity versus symmetry 3) It grasps architecture in terms of space versus mass. Bauhaus architecture was concerned with the social aspects of design and with the creation of a new form of social housing for workers. This may be just another one of the reasons it was embraced in the newly evolving cities, at a time when socialist ideas were so prevalent. This style of architecture came about (in part) because of new engineering developments that allowed the walls to be built around steel or iron frames. This meant that walls no longer had to support the structure, but only enveloped it – from the outside. Perhaps no trend within Modern architecture so neatly captures the imagination as the almost mythic status of the Bauhaus. Emerging in Dessau, Germany, during the shocking aftermath of World War I, the famed institution was conceived as a reformation of applied arts education. The principle was simple: to reject the salon arts of the haute-bourgeoisie in favour of a craft tradition in order to erase the class distinctions between artist and craftsman. Yet this was not a rejection of the modernizing impulses of the rapidly industrializing, urbanizing German state (one that was facing an increasingly dire socio-economic predicament). 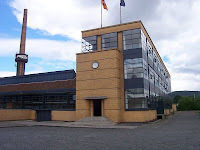 Instead, as developed by Bauhaus director Walter Gropius, the applied arts were to be taught in a workshop-based design education, with a reconciliation of craft design and industrial production. Under the tutelage of pioneering Modernists, including Lázló Moholy-Nagy, Marcel Breuer, and Theo Van Doesberg, the Bauhaus students produced work inspired by a stripped-down, functional aesthetic, one obviously influenced by Russian Constructivism. Their approach rejected the classical notion of composition through contrasting materials and forms -- instead, it sought to bring out aesthetic properties inherent in the materials themselves, as revealed through their disjunction and arrangement in space. Indeed, from Herbert Bayer’s sans-serif typography to Gropius’s seminal Bauhaus building of 1926, there emerged an objective sensibility that championed elements devoid of ornamentation and excessive detail. The objective approach led to an embrace of a serialized industrial production process that was applied to any variety of craft making, from the assembly of chairs to the weaving of tapestries.